How does a storyteller capture the tale of 335 miles? That was the challenge facing me last spring, when I was assigned the job as producer of a television documentary for WQED. The task would be to bring to life the experience of cycling the bike trail that stretches from Washington, D.C. to Pittsburgh, PA.
It’s two trails, really—the C and O Canal Towpath from D.C. to Cumberland, Maryland, and the Great Allegheny Passage, which follows the old railroad right of way from Cumberland to Pittsburgh’s Point State Park. The trail has grown in popularity in recent years, becoming a favorite of cyclists from around the world. It was a dream assignment. I’ve cycled the GAP trail many times and, several years ago, cycled both trails in five days—an adventure so vivid in my memory that in the years since I’ve talked about it to anyone who would listen. But there’s a difference between telling a story from experience and capturing it on film. A path of that distance presents the problem of telling a linear story of a dirt and crushed limestone path surrounded by trees. “How do we make it so this is not just a brown and green film?” I asked my production team. That would be the challenge. 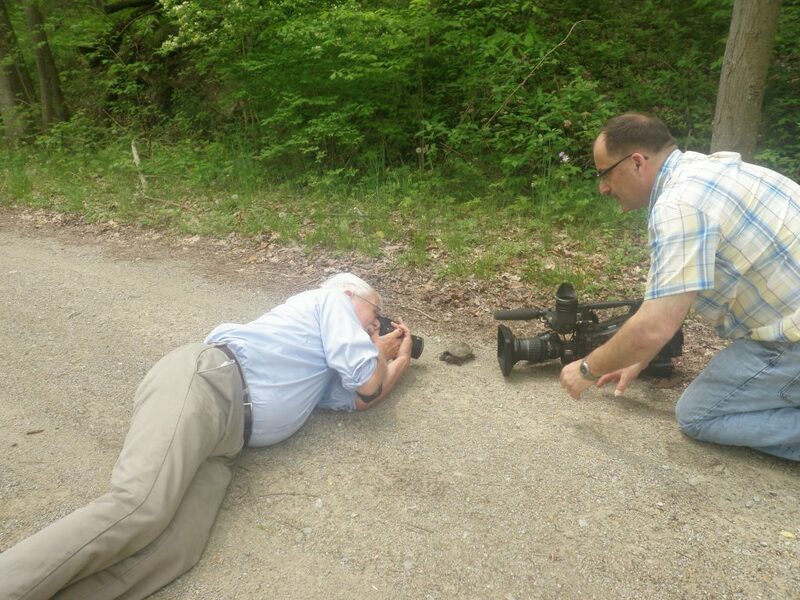 Here’s a photo of our cyclist Paul Wiegman on the ground photographing a snapping turtle on the Great Allegheny Passage. Also seen is Paul Ruggieri, photographer for The Great Ride. Because there is so much that’s interesting around and just off the trail, we decided to make this a film about both the trail and the land and towns through which it passes. From the trail towns of Cumberland and Hancock, Maryland, to the popular recreational centers of Ohiopyle State Park and Confluence, Pennsylvania, we found as much to see off the trail as on it. To tell the story, we divided those 335 miles into six sections; each section would have a cyclist-tourguide, whom we would follow along the path. And yet, this was to be a film about being on a bike, taken from the perspective of a person riding a bike. To accomplish that part of the story, we turned to technology. There’s something called an OSMO, a small steady-camera that can be attached to handlebars or even to a bicycle helmet. It captures the trail and surroundings from the perspective of the rider: the viewer can see exactly what the cyclist is seeing. Our cyclists were good sports, never losing their patience or senses of humor as they broiled in the July and August sun and humidity, riding past us before being asked to “go back and ride past here again, this time with a camera on your head.” One of our cyclists, Paul Wiegman, rides a recumbent tricycle. Asking him to go back and ride past us again required a series of three-point turns on that trike. He never lost his sense of humor, even when we asked him to lie down on the path to get up close and personal with a snapping turtle. Those who have been on a television or film set will tell you how tedious the work can be. The tedium lasted through whole weeks as the team and I lugged equipment to parts of the trail too far from the trailheads to be reached by car. Our cyclists endured long afternoons of riding back and forth over the same fifty yards of path. I suppose we could have attached a camera to one cyclist’s head and followed him the whole 335 miles. It might have been easier, but it wouldn’t have done the trail justice. All of those long days on the trail produced well over a hundred hours of footage. All of it was edited down to about an hour. Does that hour capture the beauty of the trail, the charm of the towns, the whole spectacular experience of cycling it? I hope so. You can see for yourself. 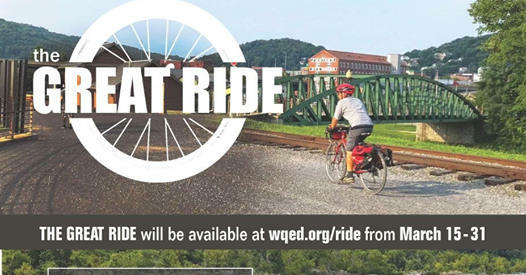 “The Great Ride” can be streamed online through March 31st at www.wqed.org/ride. About the author: Beth Dolinar is a writer, Emmy-award winning producer, and public speaker. She writes a popular column for the Washington “Observer-Reporter.” She is a contributing producer of documentary length programming for WQED-TV on a wide range of topics and currently teaches as an adjunct faculty member at Robert Morris University. Beth has a son and a daughter. She is an avid yoga devotee, cyclist and reader. Beth says she types like lightning but reads slowly — because she likes a really good sentence.